The Chumash, Malibu's original human residents, revered Sky Coyote as a sacred trickster and associated him with the north star. He plays a game of chance with the sun each year on the Winter Solstice, legend says. If he wins there is rain, but when the sun wins, the land is stricken with drought. The current drought is exacting a price on every living thing in the West, and Coyote's terrestrial kin—despite their intelligence, adaptability and cunning—are no exception. 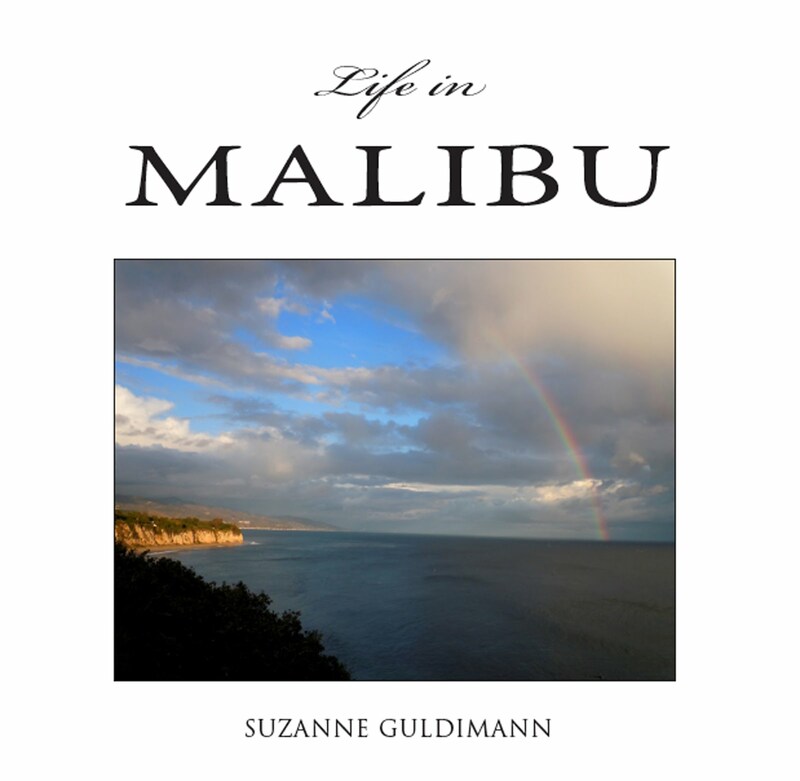 I have great respect for Malibu’s indigenous wild dog, who survives and thrives despite habitat loss and urbanization. That respect includes that knowledge that coyotes will catch and eat our much loved cats if we let them out, and the neighbors' chickens, too. Many people never see their wild canine neighbors, but everyone has heard them: their eerie and oddly musical pack song is part of the nighttime soundtrack of Malibu. This year, however, the prolonged drought is driving coyotes into residential neighborhoods in search of food and water and causing conflict with humans. 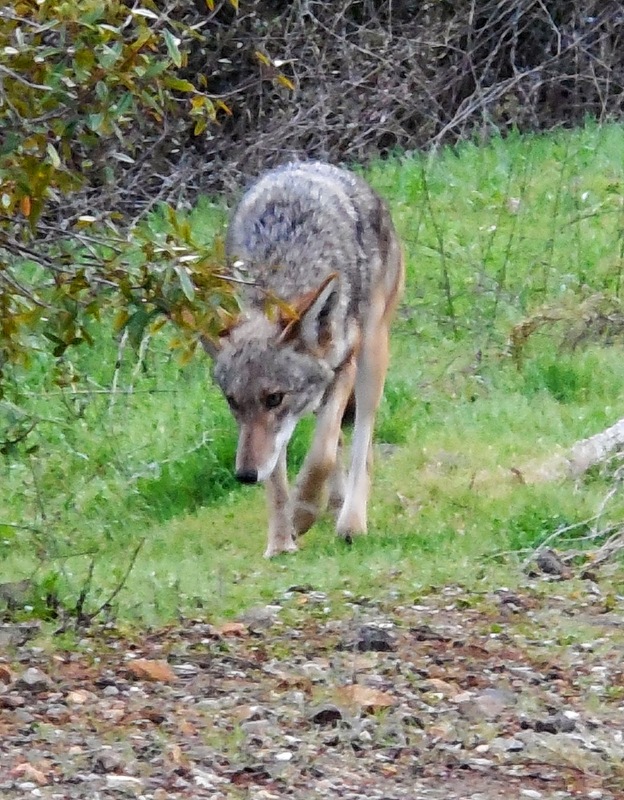 Anyone who has lived here for long learns quickly never to let cats and small dogs out of sight outdoors and to secure chickens, goats and other livestock, but it is vanishingly rare for a coyote to attack large animals or humans. It's helpful to remember that coyotes aren't actually very large. 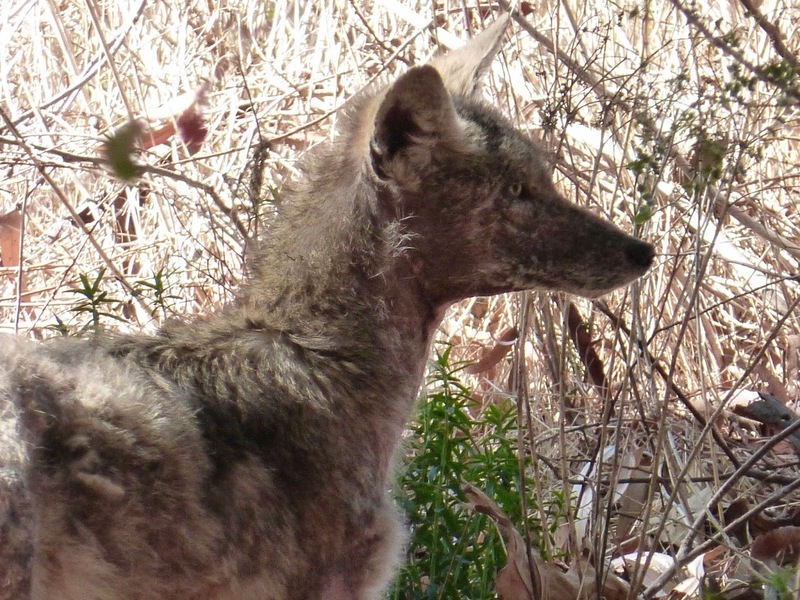 Even the biggest, healthiest coyote rarely weighs more than 30-35 pounds. That thick, fluffy fur coat and the big ears help them to look larger than they are and the deep-seated human fear of wolves and their kin that has for generations generated stories of monsters like werewolves and skinwalkers invests coyotes with a fierceness that they rarely possess in reality. I’ve covered coyote-related issues for the Malibu Surfside News for a number of years and have never encountered a credible local incident involving an attack on a human. Humans, on the other hand, take a massive toll on coyotes. According to a recent Washington Post article, the federal Department of Agriculture's Wildlife Services reported killing 75,326 coyotes in 2013. Wildlife killing contests take place in California, despite being technically illegal under state Department of Fish and Wildlife regulations. 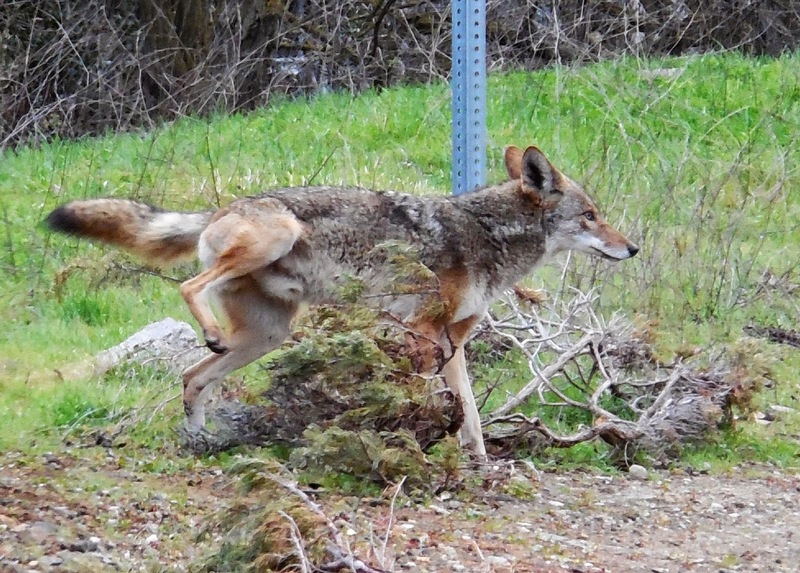 A "Coyote Drive" in Modoc County is currently drawing fierce opposition. But coyotes are also increasingly the inadvertent victims of secondary rodenticide poisoning. That's because, while they will eat any small animal that they can catch, their main source of protein comes from rodents, including pocket gophers, mice and rats—the primary targets for rat poison. 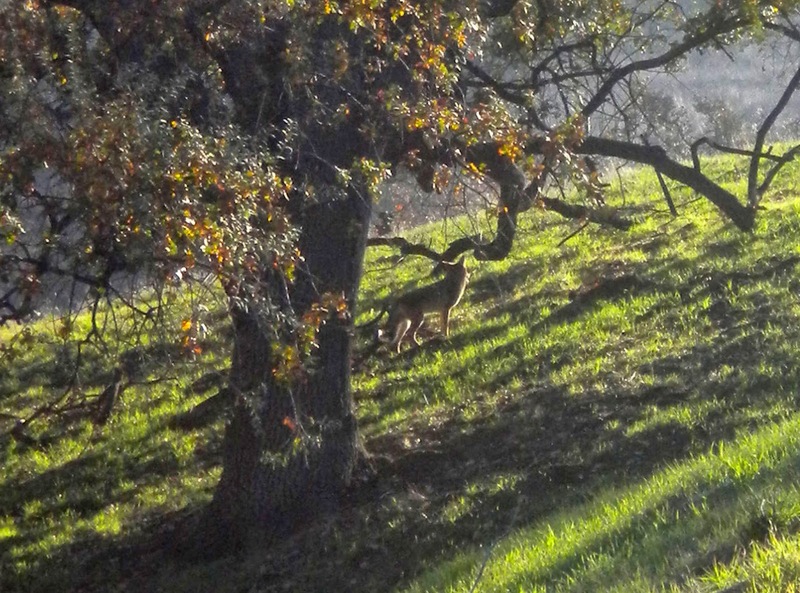 This Serra Canyon coyote still haunts me. It was threadbare and covered with sores, a victim of secondary rodenticide poisoning that attacks the animal's immune system and makes it susceptible to a potentially fatal mange. 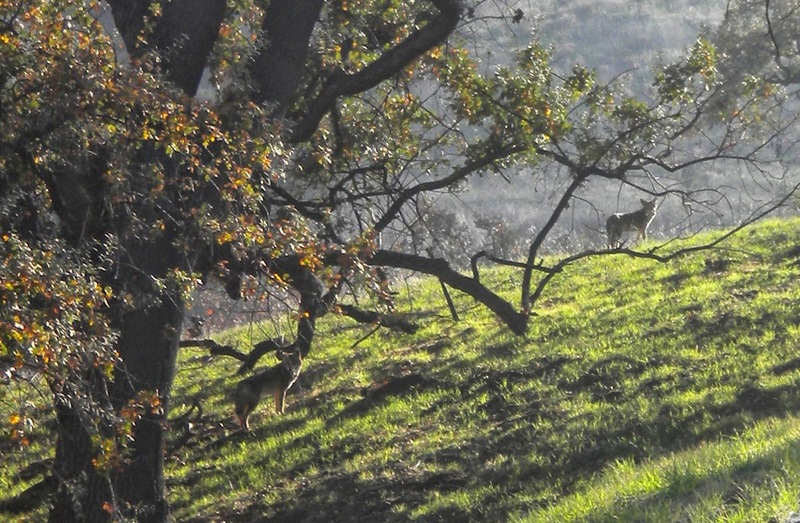 The National Park Service has been studying the coyote population of the Santa Monica Mountains for almost two decades. According to NPS research, the coyotes' diet—in order of frequency—consists of fruit, rabbits, woodrats, pocket gophers, voles, squirrels, other small mammals, reptiles, birds, insects, deer, and trash. Domestic animals make up less than one percent of the local coyote diet. Coyotes aren't sweethearts—they are efficient hunters and scavengers who will eat pretty much anything they can find, including pets, but they aren't monsters. They kill from need not with malice. Hunts are conducted in silence. Coyotes sing to communicate with each other, not to announce that they are hunting. Coyotes are thought to mate for life, and males help females feed, protect and educate their offspring. Older siblings and other non-breeding members of the coyote's extended family have been observed helping to take care of pups. Because of the coyote's social structure coyote/dog crosses are uncommon in the wild. According to Humane Society reports, genetic testing reveals that there are actually few genuine "coy-dogs." The evidence indicates that most of these are bred by humans, and then dumped in the wild when their human creators find they are too wild to train or subdue. According to Riley, coyotes are more likely to be nocturnal in urban areas, but it's not unusual for them to be active during the day. Pet owners need to be aware that, just because you don't see a coyote, doesn't mean the coyote isn't nearby. They aren't called trickster spirits for nothing. The experts are unanimous that coexistence is the key to coping with coyotes. Removing attractions like dense brush, unsecured garbage cans and fallen fruit in backyard orchards can help prevent coyote-human interactions. Filling gaps in fences can also help reduce backyard incursions. A coyote carefully scopes out the area. Coyotes are often attracted to patio BBQs or outdoor kitchens, where meat drippings and scraps, or just the smell of food, lingers. They are also attracted to pet dishes and bird feeders. Making sure that there are no scraps of food and sweeping up scattered birdseed can help discourage unwelcome visitors. “A fed coyote is a dead coyote,” is one of Fox’s axioms. Malibu coyotes will eat palm tree fruits and ornamental berries. They will also raid all types of fruit trees and seem to have a passion for figs. Domestic animals should be fed indoors and kept in at night. Cats, small dogs and young children should never be left unattended. Livestock, including chickens and rabbits, should be secured in pens and hutches. Coyotes can easily jump a six-foot fence, and they aren’t the only predators out looking for an easy meal—they share the night hunt with owls, foxes, bob cats, and raccoons. 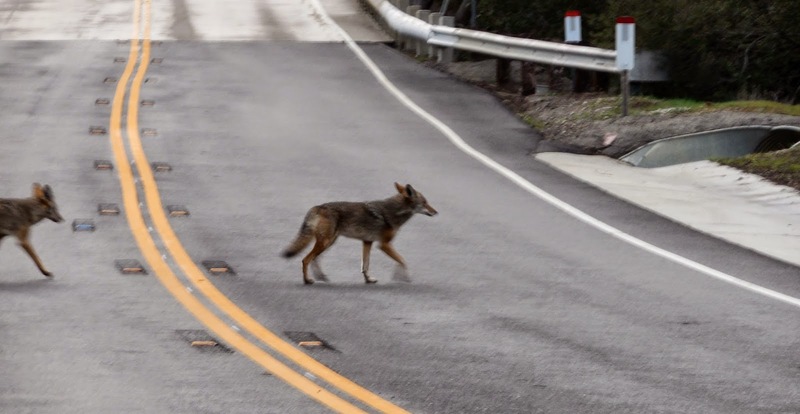 A pair of coyotes cross Mulholland Highway and vanish into the storm drain on the other side. Road crossing is a major danger for all local wildlife, even in remote areas with low population density, and one of the leading causes of mortality. This male coyote paused to leave a calling card before vanishing. "I see you watching me and this is what I think of you," he seems to say. He is a trickster, after all. Fox recommends using a rattle made out of an empty can containing a handful of pennies, whistles, air horns, or a pop-up umbrella. She stresses that the goal is to frighten the coyote, not harm it or harass it. Fox says that coyote behavior is similar to that of domestic dogs, and that observers can learn from coyote body language. Recognize that the coyote is indigenous to Calabasas. We built our city in the coyote's backyard and the coyote has adapted to this environment. We should adapt to the presence of the coyote. I hope that's a goal we can all attain.